I know everyone is a little pumpkin obsessed these days (present company included), but there is one Fall flavor combination that I think I prefer even more: maple pecan! Even Starbucks is getting on the bandwagon with their maple-pecan latte, which is delicious, btw. Last Fall I made this maple pecan cake which may just be my favorite cake of all time (it tastes like a giant stack of pancakes). So, this Fall I couldn't wait to get the gang back together and make some more delicious maple pecan treats. Since it is October after all, I couldn't leave pumpkin completely out of the mix. Hence, we have maple pecan pumpkin bread! This recipe is very similar to my glazed pumpkin bread recipe. The only changes I made were to replace some of the sugar with maple syrup to give the bread a subtly sweet maple flavor; it also makes the bread extra moist! To start, cream together butter, brown sugar, and maple syrup for about a minute, then add in the eggs and pumpkin and mix until the are incorporated. Move that bowl aside and whisk together the flour (in this case I used both AP and whole wheat flour), baking powder, baking soda, and pumpkin spice just until there are no lumps or clumps. Then mix half of the flour mixture into the butter mixture. The other half of the flour mixture will actually be tossed with the chopped pecans before being mixed in with the rest of the batter. This helps keep the pecans evenly disbursed throughout the bread. Then, pour the batter into a loaf pan and sprinkle a few extra pecans right on top. Finally, bake the loaf at 350 degrees for almost an hour. Just sit back, clean some dishes, and wait for your kitchen to fill up with the most wonderful maple, pecan, pumpkin spice scent. Seriously, someone should bottle that scent and make it into a candle! The hardest part of most recipes (for me, at least), is waiting for the baked goods to cool before I dig in. Since this pumpkin bread takes almost an hour to bake, by the time it comes out of the oven the anticipation is killing me. Oh, and the smell. Have I mentioned how good it smells? (Seriously, someone make this a candle! I will buy your first 20.) Yeah, that won't help either. But I encourage you to wait as long as possible before slicing into this amazing loaf. It will take at least 20 minutes for it to cool enough to cut into without crumbling into pieces. Preheat oven to 400 degrees and line a loaf pan with parchment paper or spray with non-stick spray. Set aside. 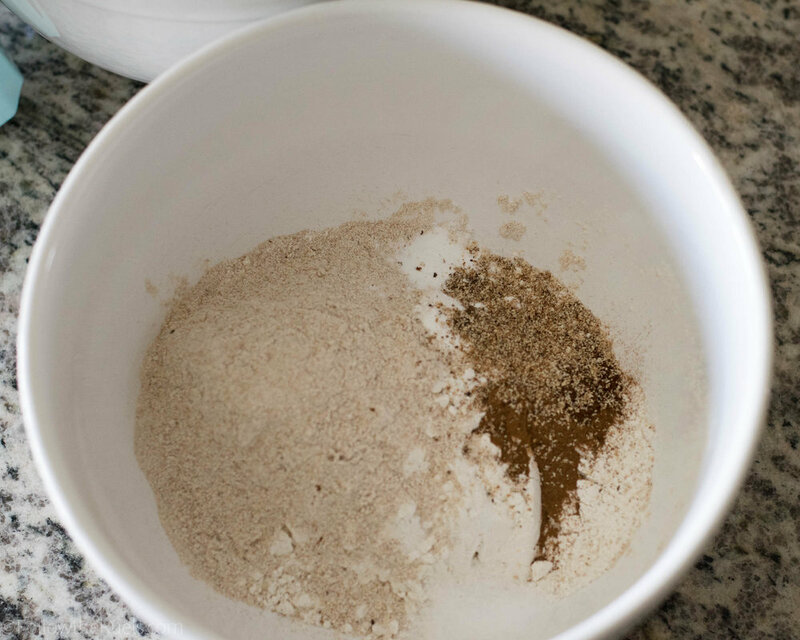 In a medium bowl, whisk together flours, baking soda, baking powder, and spices. Set aside. 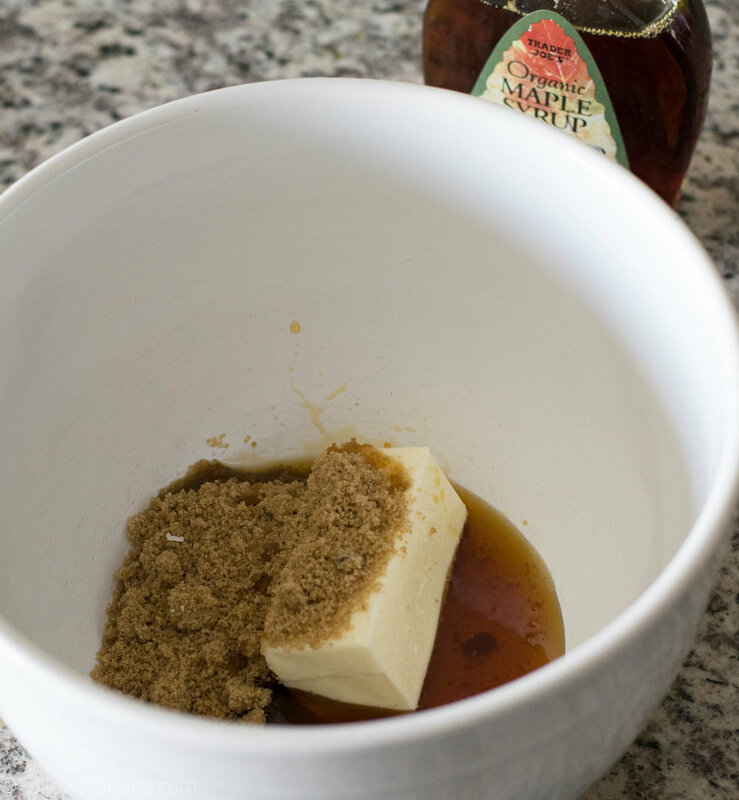 In a large bowl, cream together butter, sugar, and maple syrup with an electric mixer (or a stand mixer). Mix in eggs, one at a time, then mix in the pumpkin. Pour half of the flour mixture into the pumpkin mixture and mix until just combined. Add the pecans to the remaining flour stir just to get the pecans coated in flour. Add the pecans and flour into the batter and mix just until the flour is incorporated. Spoon or pour the batter into the prepared loaf pan. Use the back of a spoon or spatula to even out the top. Sprinkle with extra pecan pieces. Turn oven down to 350 degrees, then add the bread to the oven. Bake for 50 to 55 minutes, or until a toothpick stuck into the center comes out clean.